Samoa blows halftime lead to lose to N.Z. Promising but not good enough. 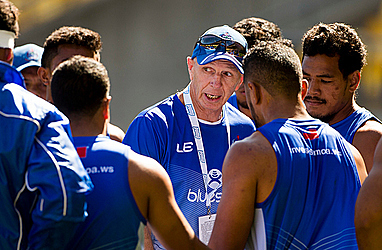 That’s the verdict after the Manu Samoa Sevens blew a 12-5 lead at half time to sink to New Zealand in their opening game of the Dubai Sevens tonight. Tila Mealoi and Alatasi Tupou had scored to give the men in blue some breathing space in the first spell. Despite leaking a try to Reagan Ware and Tupou failing to covert Mealoi’s try within the new mandatory 30 seconds, Samoa who played extremely well in the first half had their noses in front. They had more possession, completed more passes and were making some great decisions. But all that changed 60 seconds into the second spell when New Zealand scored through Dylan Collier to close the gap to two points, 12-10. A desperate tackle from Tila Mealoi prevented another New Zealand try but cost Samoa two minutes in the bin which New Zealand immediately capitalized on with a try to take the lead, 12-17. Samoa still had time to hit back. But they couldn’t through a silly error. New Zealand closed out the game through Sione Molia who muscled his way through the middle against some weak tackles to score under the sticks, giving New Zealand a resounding 12-24 victory. The tournament continues with Samoa scheduled to play U.S.A. and Argentina in what has been termed the pool of death.